Using Intel® Active Management Technology, privileged users can support fully provisioned Intel® vPro Windows systems below the OS level, regardless of the status or power state of these remote systems. 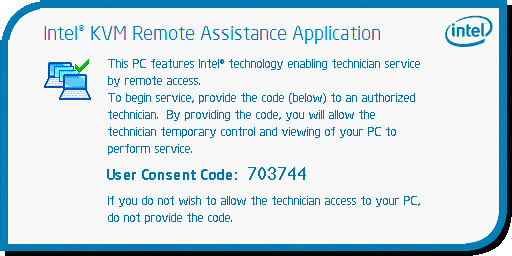 To use Intel® vPro, you must have access to a Jumpoint with Intel® vPro enabled and must have the user account permission Allowed Jump Methods: Intel® vPro. Remote systems using vPro with AMT version 5 or higher may be supported with BeyondTrust. While vPro is supported by clustered Jumpoints, configuration options are available only to standalone Jumpoints. Clustered Jumpoints have no configuration options for Intel® vPro. Power off or power on the host machine. You may also reboot the host machine normally, to BIOS, to PXE, or to a selected disk image. Select an ISO or IMG file to mount on the remote system. File location is set during Jumpoint configuration. Start or stop viewing the remote system's display using KVM. Send Ctrl-Alt-Delete to the remote computer. From the Reboot menu, select Reboot and Enter BIOS to start the BIOS boot process on the remote vPro system. You will then have access to the BIOS for troubleshooting purposes. Select Reboot Using PXE to boot the remote system using a network interface independently of data storage devices or installed operating systems. Reboot to a Disk Image uses IDE-R to boot the remote system to a specified ISO or IMG file. Note that the remote system will display the screen exactly as you see it, even when booting to another image.